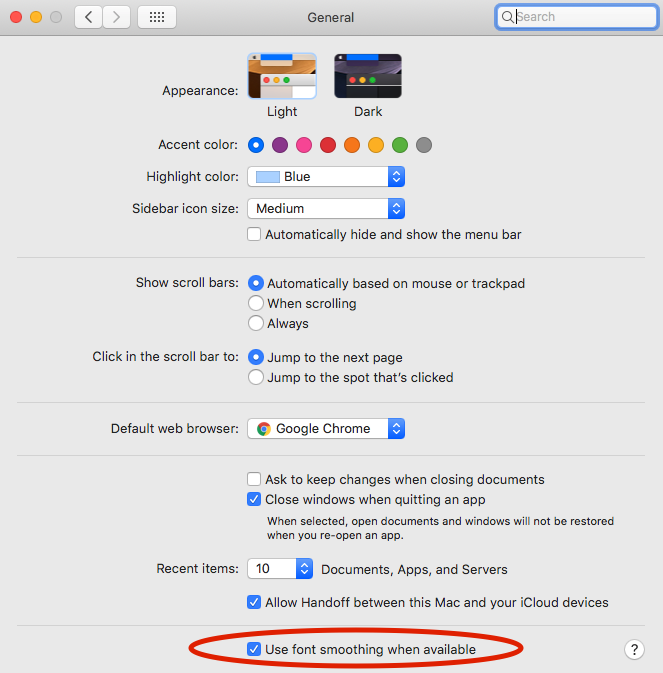 If you have a non-retina Mac or you are using a non-5K external display, you’re going to notice that fonts appear blurry after upgrading to MacOS 10.14 Mojave. With the addition of a Dark theme and the added complexity of sub-pixel rendering fonts over dark backgrounds, Apple decided to disable sub-pixel anti-aliasing in MacOS 10.14 Mojave. I noticed the change the moment I logged in and I found it unbearable while working in my code editor. Luckily there is a combination of commands that will help make fonts look closer to the way they did in MacOS 10.13 High Sierra. To Apply the fix you’ll need to open up the Terminal app. You can do so by opening the “Utilities” folder in your “Applications” folder and running “Terminal” or by searching for “Terminal” in Spotlight. Enter the following two commands in Terminal. After running these commands you need to log out of your user account and then sign in again. Now open System Preferences and click on “General”. You want to check the box at the bottom of the pane that says “Use font smoothing when available”. You’ll notice fonts look closer to normal in most situations (although not quite perfect). Notification messages and misc system text over the new dark grey backgrounds will now appear blurry in some instances. For me this is an acceptable trade off. To restore Mojave fonts back to default settings enter the following commands in Terminal.